How did you get into Craftivism? I suppose craft is in my blood, my Grandma, Mum, Aunties and cousins are all really creative people and I’ve been doing crafty things since I was a kid. I’ve also been involved in campaigning for human (especially migrants) rights since I was a student. So when I came across Sarah’s book, A Little Book of Craftivism in the Baltic Arts Centre in Newcastle, I picked it up and spent the rest of the morning reading it, completely engrossed! I live in London and saw that TRAID and the Craftivist Collective were organising a Stitchable Change Makers workshop, so I went along and was inspired by all the lovely people and positive ideas. Sarah, who runs the Craftivist Collective, is an entirely new kind of activist. She has a calm, thoughtful manner, which really encourages thought and open dialogue and promotes self-belief. It was pretty inspiring to be in a room with so many ace people. After that, I knew I wanted to be involved with the Craftivist Collective and Craftivism in general. 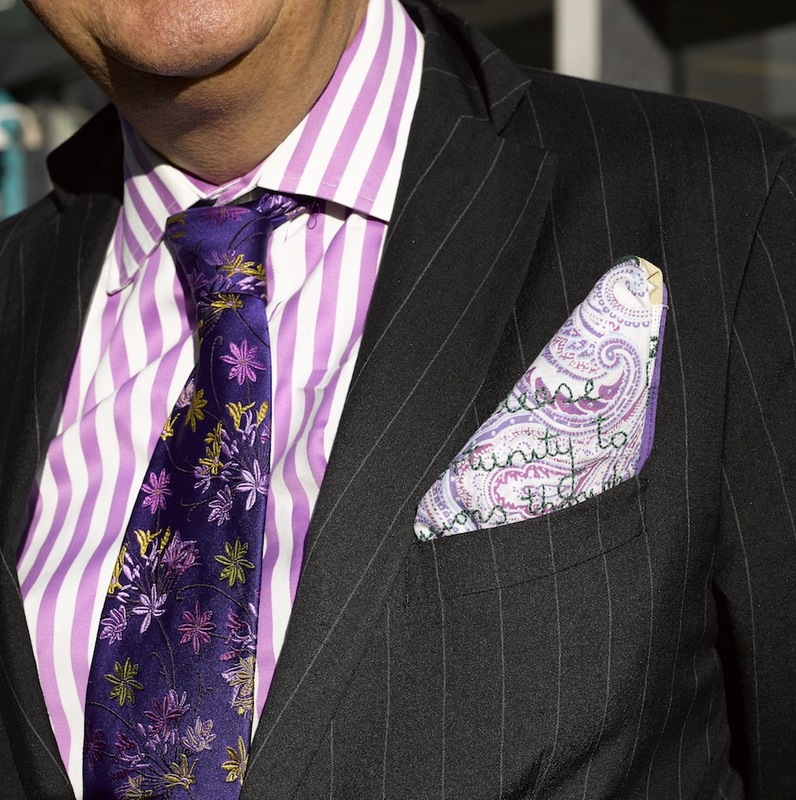 I created a hanky, accompanied by a letter for Alison Brittain, one of M&S’ Board of Directors, to encourage her to adopt the Living Wage for employees. 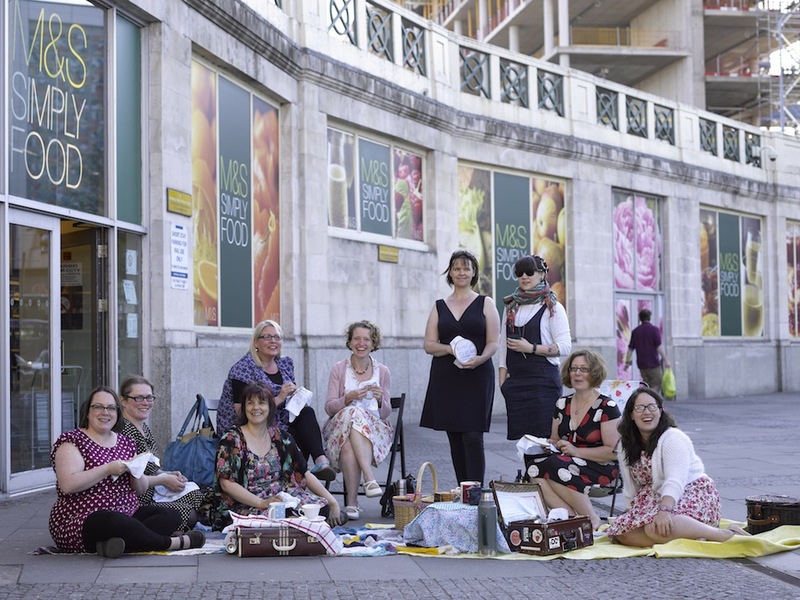 I also went to a Craftivist stitch-in outside an M&S in North London with ShareAction, where we finished our hankies and spoke with some curious passers-by about what we were doing! 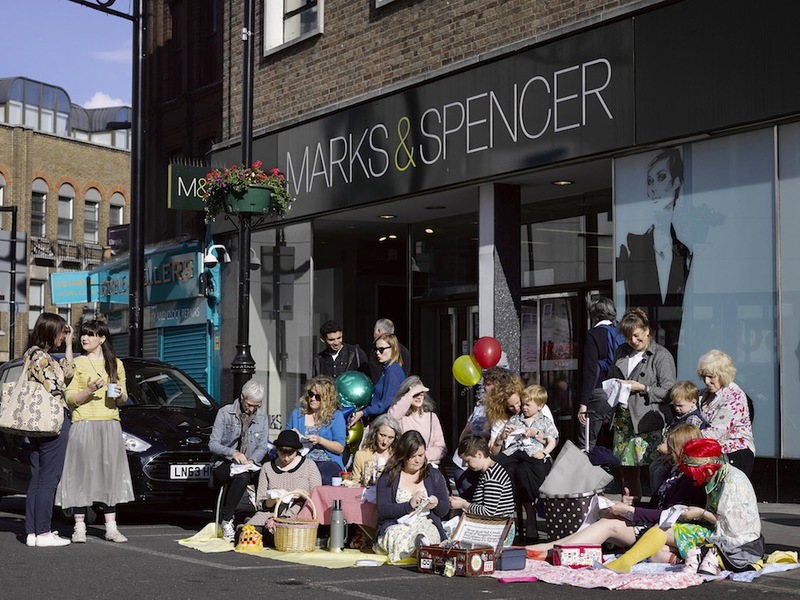 The idea of the stitch-ins is to show M&S that in addition to major shareholders with billions of pounds under management, its core customer base is also fully engaged and supportive on the issue of the Living Wage, and that they expect the company to show leadership on this basic fairness issue. I was really shocked and saddened to hear that a company like M&S, who display some commitment toward the environment and worker’s rights, through their Plan A initiative, refuse to pay their workers a Living Wage. To be clear, this means that some M&S workers may have to claim benefits alongside full time work, just to keep their heads above water. For a FTSE 100 company, this is totally unacceptable! M&S Chief Executive Marc Bolland is paid £2.1million a year and last year but his company refused to consider a Living Wage at its Annual General Meeting (AGM). Later, at a meeting with campaigners, the company again refused to consider paying the Living Wage. Each hanky encourages board directors of M&S to commit to paying the Living Wage of £9.15 in London and £7.85 across the UK to all staff. 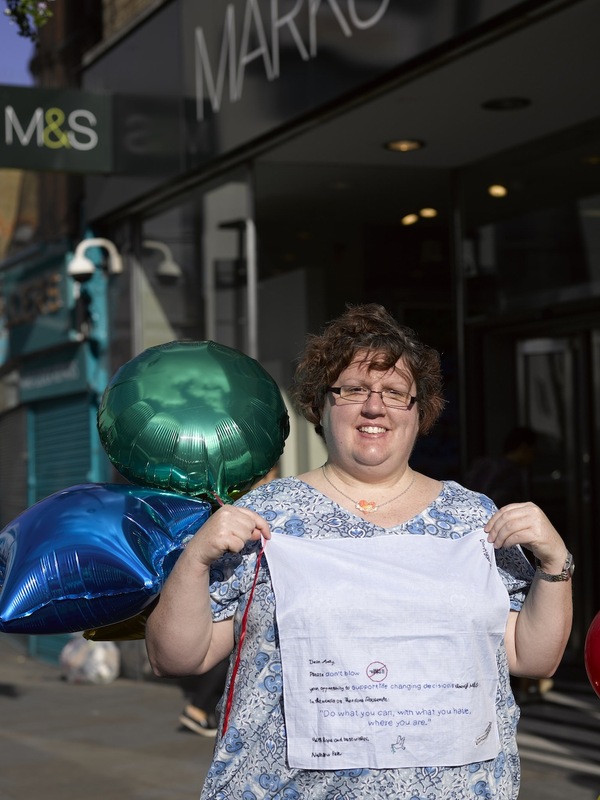 On the 7th July a group of Craftivists will be attend the M&S AGM to deliver the hankies to the Board Members and to call on M&S to provide a Living Wage to their workers. Unfortunately, I can’t be there, as I’m on honeymoon but I will be there in spirit! What response do you hope to get from your craftivism? Ideally, I would like M&S to adopt a Living Wage for all employees! I would like this to start a dialogue, at M&S and other companies about fairness and economic justice. What were you thinking about when you were stitching? I also thought about M&S workers and all the challenges that they face on a day-to-day basis and how that could be partially alleviated by paying the Living Wage. No one should ever have to live with chronic economic insecurity and I hope that Alison understands that. Most of all, I wished Alison and all the workers for M&S strength, hope and happiness. 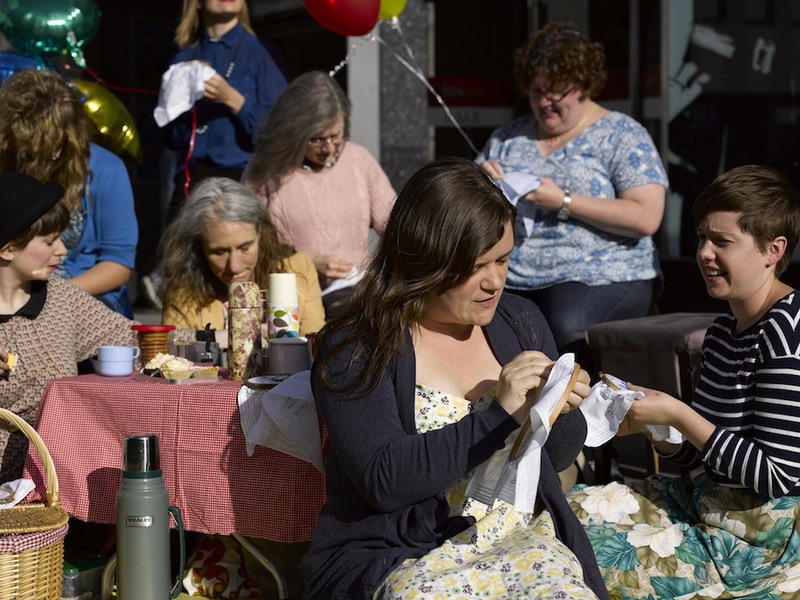 How is Craftivism going to change the world? To me, the act of making something can only be done with compassion. Whilst you might begin a project feeling disgruntled or angry towards the receipient, the act of sitting down and making something for them challenges your assumptions and by the time the project is finished, while you remain angry at the situation, you feel empathy, hope and respect for the beneficiary of your project, while still demanding systemic change. Craftivism is about using the tools we have to reach as many people as possible, to convey a powerful message in a thoughtful way and trying to bring about systemic change to make a more just world. To me, creating objects with powerful messages that are delivered to those with the power to effect immediate change, is a good way to start or maintain a dialogue or to exact pressure on a group to change policies which harm other people. Traditional activism can be brilliant but it can also alienate a lot of people. Often dominated by white, straight, middle class, shouty dudes, many people (especially members of marginalised groups) feel as though they don’t have a space for their views to be heard. Or that because they don’t/can’t buy into an ‘activist lifestyle’ wholeheartedly, means that they feel excluded. In times of austerity, I want people to know that just because you can’t afford to buy Fairtrade teabags or you’re not vegan, doesn’t make you any less of an activist. People bring what they’re brilliant at to activist groups if they are supported, nurtured and given a safe space. I feel that Craftivism can provide that for a lot of people. People have a need to be creative and sometimes because of work/education/life in general, this is squished out of them. Going and buying craft materials (I get most of mine from charity shops to reduce the cost) and sitting down to create something that they know will make someone think and that could effect lasting change can be very empowering. Craftivism is a movement which strategically uses craft to change the conversation about inequality and to show solidarity with those who have been disenfranchised through uncaring and destructive policies. I’m from Scotland and one winter when I was a student it was terribly, terribly cold (even by Scottish standards). My flatmate and I were doing everything we could to keep warm but we couldn’t afford the extortionate heating bills. At this point, I dug out this beautiful Icelandic jumper my Grandma had knitted in the 80’s, it became the only thing that would keep me warm through that winter. And, even though my Grandma was no longer with us, I felt that she was there, supporting me and helping me because of something she’d made with love and care. To me, that demonstrates the implicit message of craft and the power of creating things for people. Not everyone is a skilled public speaker and Craftivism can be a way for those who are introverted, quiet and thoughtful types to participate in a wider movement for social justice. But to me, the real message of Craftivism is to couple this implicit, gentleness with is a strong and explicit desire to speak out against injustice and to demand change on our own terms. This means using craft to get the message of social justice, fairness and equality across and to get those in positions of power to listen to our voices. It’s far more difficult for people in charge to ignore a beautiful, unique object that someone has poured time and care into. To remain gentle, yet forceful in our struggle for social justice. Traditionally, we did this through shouting, now we can add our forceful whispers, thoughtfully stitched on to beautiful fabric, as well. Thankyour for sharing your superb information.Its good to see such a marvellous information.I hope you will also share more information in future.Thanks you.